parentwin: Woman Hands Out Fat Shaming Notes to Kids so She's not Seen as the 'Mean Lady' -- Oh. Woman Hands Out Fat Shaming Notes to Kids so She's not Seen as the 'Mean Lady' -- Oh. Perhaps by now you've seen this? Now, you might this this is some spoof out to rile the social justice warriors. I admit, I wasn't sure at first. But no. This is a real note, courtesy of Cheryl from Fargo, North Dakota. In fact, here she is on y94 defending her decision. The DJ asks her why she doesn't just give out healthy alternatives, and her reply is that she doesn't want to be the mean lady. So she'll give all the kids candy, and the ones she deems overweight will also be getting this incredibly well worded, and caring, note. There are so many things wrong with this I hardly know where to start. Let's first define "concern trolling" okay? Since apparently a lot of people don't seem to understand the concept. Now, this is a case of in real life concern trolling. The woman holds herself up to be helping the community by inserting a note which she finds to be "well-meaning" into those people's hands that she finds unhealthy. She has put herself into a dialogue that didn't exist, is controlling it, and wants to be seen as the good guy. 1) It's none of her business. Halloween is an opt-in holiday. Think Halloween candy makes kids fatter and you can't stand it? Opt out. Leave your porch light off. It's as simple as that. Or as the DJ suggested, give out something you consider healthy. The kids won't care. They're there for the costumes and festivities. If they ever even do care about what kind of candy they got, it's long after the fact, and they won't even remember you. Repeat this to yourself: you are not that big a deal. 2) Parents have eyes. 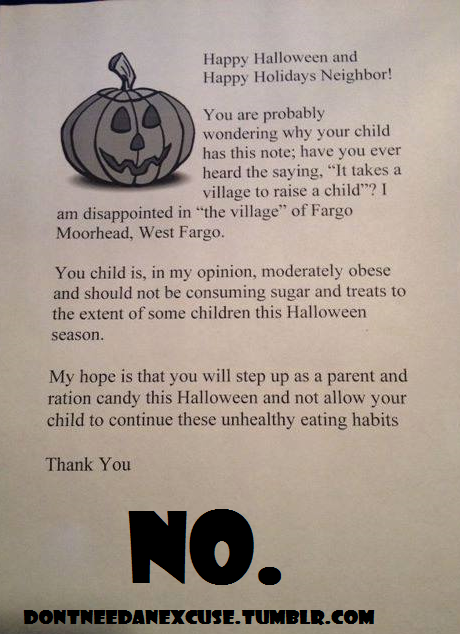 They can see their own children, they know what their children weigh moreso than even you do, and they have deemed it appropriate to allow their kids to partake in the collection of candy this year. They don't need you to tell them what they can see. They don't need you to tell them what they should do. 3) Collection of candy. That's as far as you see. For all you know that family is donating their stash this year. Or not. Not your business. 4) I happen to be a fairly thin, muscular woman--a woman some people would say is in great shape. I've eaten four bags of Halloween candy in the past two weeks. Meanwhile, I know people struggling with their weight who have eaten nothing but wholesome, doctor-approved diets in that time. Point being, thin people do not represent healthy people necessarily. Those thin kids you're referencing in your note could have far worse diets and exercise than the ones you consider to be overweight. 5) Kids of trick-or-treating age are just coming into the stage where they learn about people like you, who will judge them for what they look like as opposed to for who they are. They've not yet built the walls of self-confidence around themselves, and reading a note like this could have a very definite and a very negative impact on them. They could accidentally allow you to define them. They could lose their sense of self and start judging who they are by what you think of them. They could then pattern this for years, becaoming more and more unhappy with themselves, always feeling inadequate, no matter how much they accomplish. These kids, they don't know you don't matter. So you have to act like you do. Because you might to them. And if that's the case, wouldn't you rather be the person who shored someone up when they were feeling insecure rather than pushed them down into the depths of self-doubt and worry? In summation, here's a PSA. Happy Halloween, everybody! Remember this year to not be a total douchecanoe when handing out candy to the joyous children happy to be out and about and proud of their costumes. we are at your city or nearest places. Just remember us and we will cash your check very short period with a very low cost.